During summer there are many activities in the residential area at Maihaugen . Photo: Maihaugen . 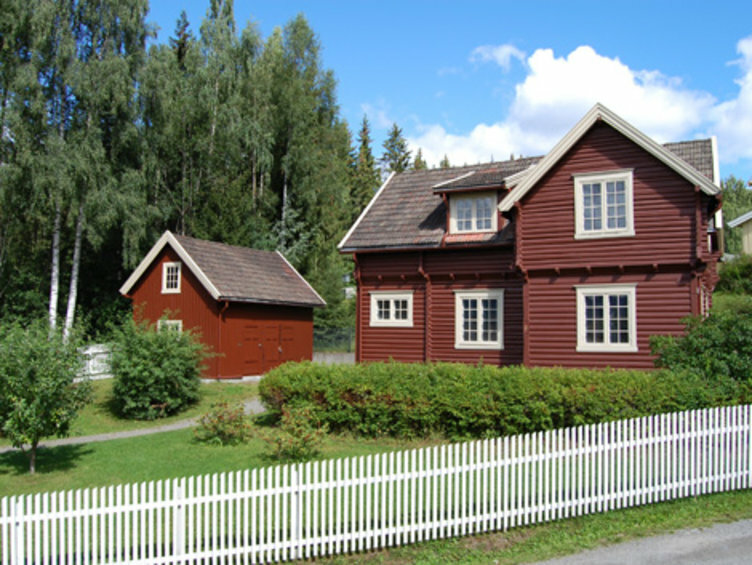 An exciting part of the Open Air Museum in Lillehammer is the residential area. Here you will find detached houses representing the various decades of the 1900s, and you can see the development of home standards and family life. No changes have been faster than during the 1900s. Industrialisation steadily provided new materials for building and fitting homes. The media society caused interior design to change rapidly. 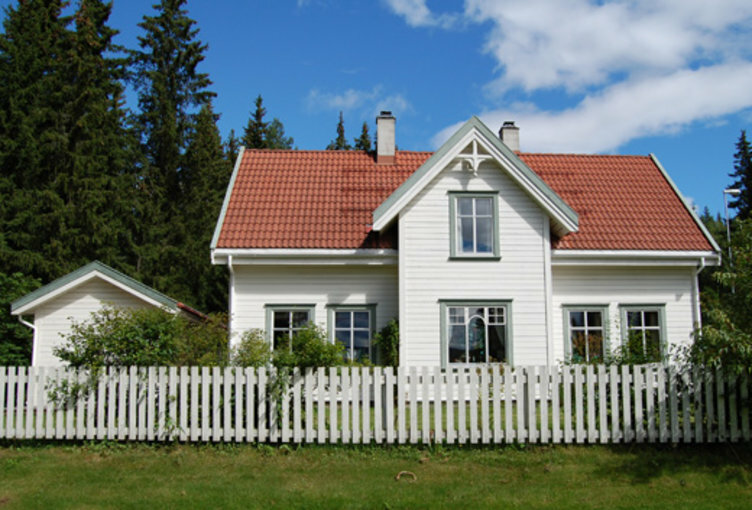 This is the reason why Maihaugen exhibits a variety of homes from the 1900s. During the high season residential area is a popular attraction with lots of activities. You can take part in the wandering theatre, remember your own childhood or show the children what growing up was like for grandparents or parents. Houses from nearly all decades are represented. The oldest houses are placed at the bottom, and the House of the Future 2001 at the top. As we visit the homes we can follow the technological development, how the kitchen and bathrooms were modernised and how the different social and economical situations played a part. We can see how the various families lived. 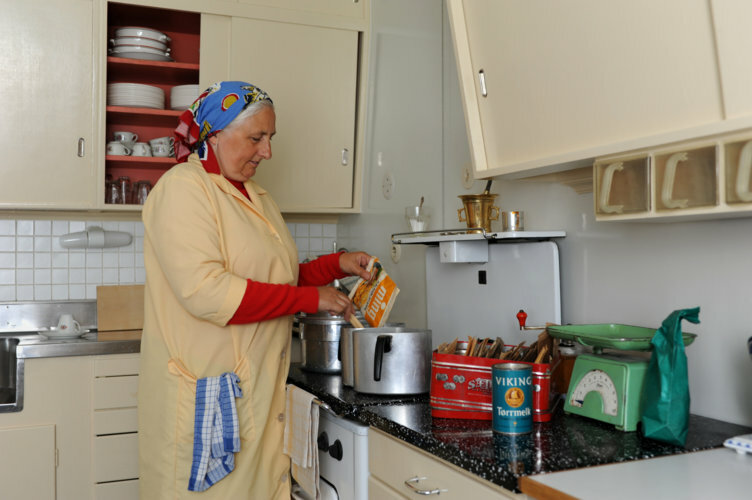 The unmarried woman in the house from the 1920s, the family of seven in the functionalist-style house during the second world war, the prosperous merchant family during the 1950s and the families in the prefabricated houses of the last three decades. We also see how equality changed and started becoming part of family life. This is where you can experience our closest history! The little reddish brown house is the first furnished home we arrive at in the road from the 1900s. The house was opened during the summer of 2015 and is the last house to be opened in residential area. It is a log house with cogging joints, with a timber framed entrance. This is an old method of building, but log houses with cogging joints were popular in Lillehammer shortly after the dissolution of the union with Sweden in 1905. The feeling of nationalism was strong, and in addition Maihaugen was an important source of inspiration. An unmarried woman in her forties was the first inhabitant of the house. She only used the ground floor. The first floor was rented out. The house had water and electricity, WC in the basement, but no hot water tank. A wood fired oven in the kitchen was used for cooking. In addition she had an electric hotplate. She used to run a café in the Storgata, we therefore assume she did not do much cooking at home. The house is characterised by strong colours. This is in line with the style of the time in certain circles. 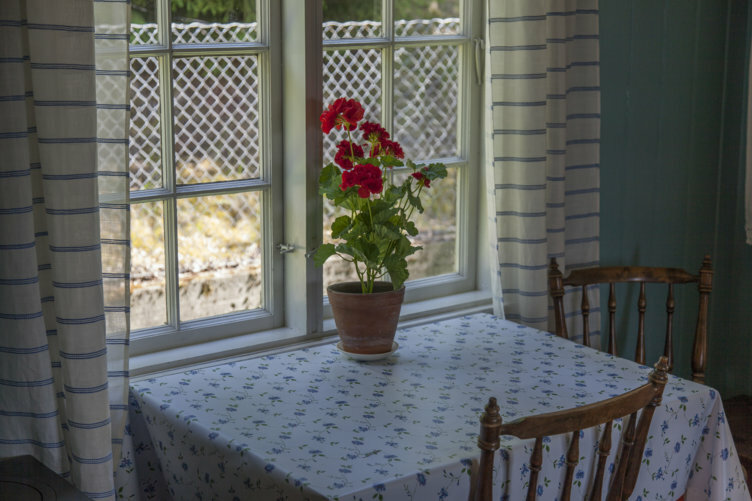 We see similar colours in Garborg’s home, Labråten, and Gerhard Munthe’s Leveld. We imagine the sky blue garden living room must have been a wonderful place to enjoy a cup of coffee. Building was started in 1920 and the house was completed in 1923. The house was originally located at Søndre gate 21 in Lillehammer. The house represents the home of a single mother with rooms for rent. It is a simple house with the main entrance through the kitchen and exit to the garden through a glazed veranda. The house from the 1920s is a log house with cogging joints. 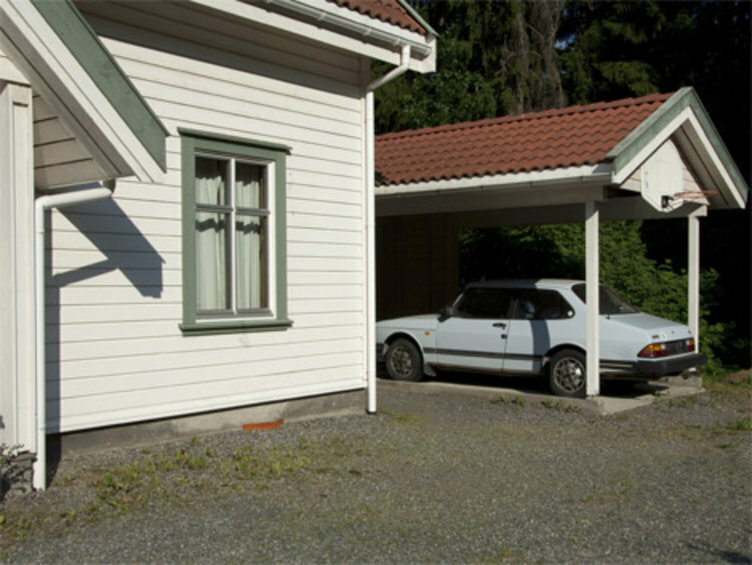 Photo: Kåre Hosar/Maihaugen. 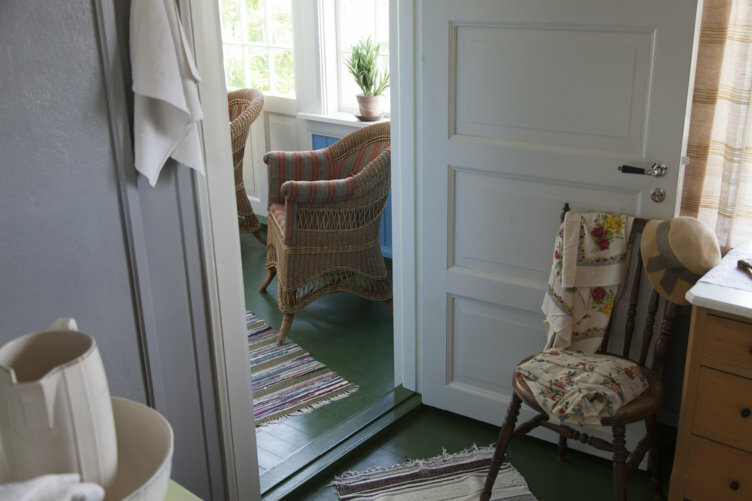 The house from the 1920s is colourful and beautiful inside. Photo: Camilla Damgård/Maihaugen. 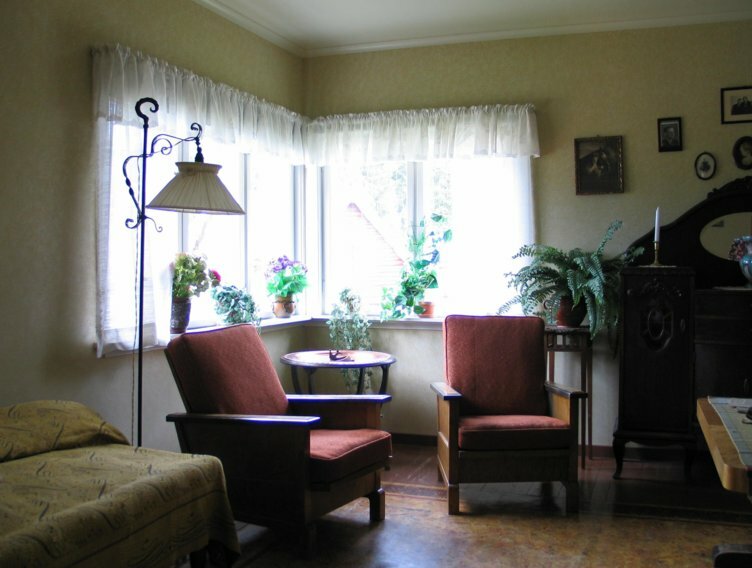 The living room in the house from the 1920s. Photo: Audbjørn Rønning/Maihaugen. 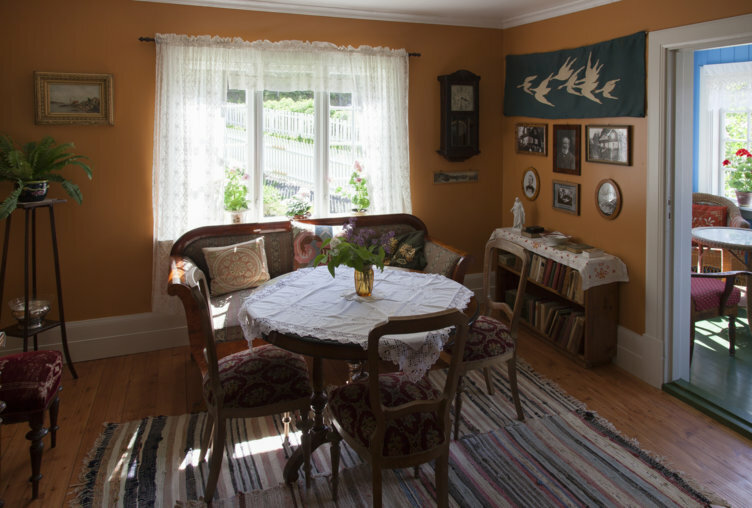 The ground floor in the house from the 1920s is fully furnished and can be visited. Photo: Audbjørn Rønning/Maihaugen. Cosy kitchen in the house from the 1920s. Photo: Audbjørn Rønning/Maihaugen. The bedroom belonging to the single lady who used to live here; she rented out the 1st floor. Photo: Audbjørn Rønning/Maihaugen. 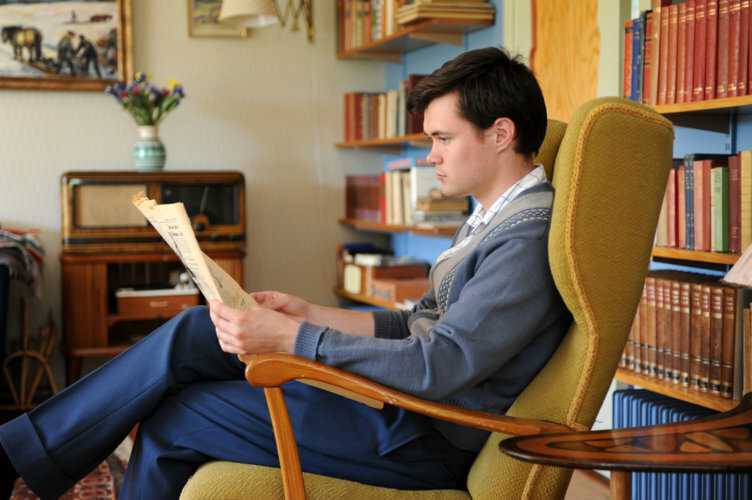 Queen Sonja's childhood home is the house from the 1930s in the residential area at Maihaugen. The house was moved from Oslo to Maihaugen and opened to the public at Queen Sonja and King Harald's gold wedding anniversary 29 August 2018. The home is restored like it was while the queen lived there from 1937–1968. The house is an example of the architecture of the 1930s. It was put up in Tuengen allé 1B i 1935 and was designed by Ernst Motzfeldt. The house was built for the Haraldsen family, and Sonja lived most of her life there until she married Crown Prince Harald in 1968. They were secretly dating for nine years before they got King Olav's permission to marry. For those years, one of the few places they could meet was here at Sonja's mother's house. The photograpy of the couple at the doorsteps of the home when the engagement was a fact, is an iconic image. This moment connects the Queen’s childhood home to our national history. A private story became official and national. When she got married 29 August 1968, she was the first civil woman in modern times to marry an European heir to the throne. The house was built in 1935. It was originally located at Tuengen allé 1B at Vinderen in Oslo. The house has a distinct functionalistic style, with hipped roof, horizontal cladding, windows by the corners and balconies with steel rails. 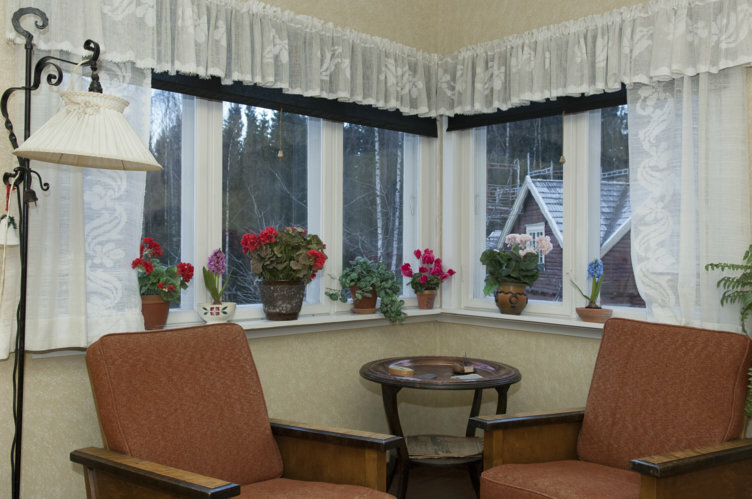 The inside of the home is decorated like it was between 1937–1968. 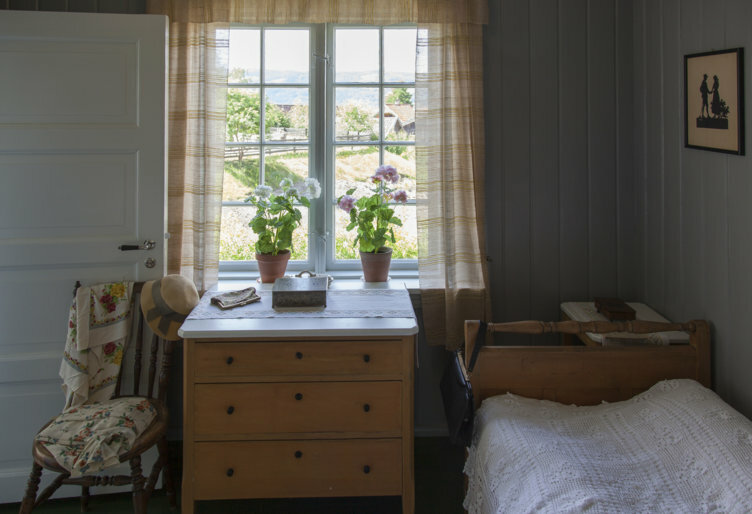 The house is furnished as a wartime home from 1944, and shows that living on top of each other was the order of the day for some. The family consisted of a mother, father and 5 children. Despite being short of space, they rented a room to a young dressmaker who gave birth to a child while living there. A young couple also lived there during one period. There is water and electricity, but cooking was done using a wood-fired oven in the kitchen. Lack of food and rationing was the order of the day during the second world war. That this is wartime is easily observed in the details, including a ration card and home grown tobacco. The windows are covered in black-outs and if you look down the dumb waiter shaft you can see the illegal radio hidden amongst eggs and jam. The house, like the telephone booth just outside, is typical of the functionalist style of architecture. Here we can find several typical details - the shape of the roof, the shape of the windows and the placement of the windows. The inside is more traditional. The furnishing shows signs of an old-fashioned style with heavy dark furniture. Most remarkable is the bed chamber with strikingly pink walls with painted silver cherries. Probably styled from exclusive wallpaper. There is a bathtub in the basement, should you be in need of a bath. The toilet is in the outhouse - it could be cold during the icy winter months. 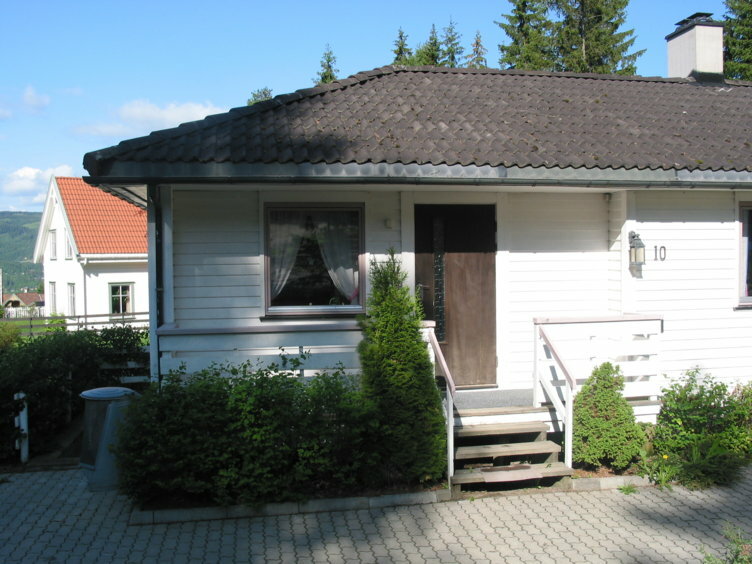 This detached house was built in 1939 and moved to Maihaugen in 1998. The house was originally located at Fåberggaten 162 in Lillehammer. It is a simple little house (64 square metres), but very modern for its time. The house has been furnished to reflect the 2nd world war. 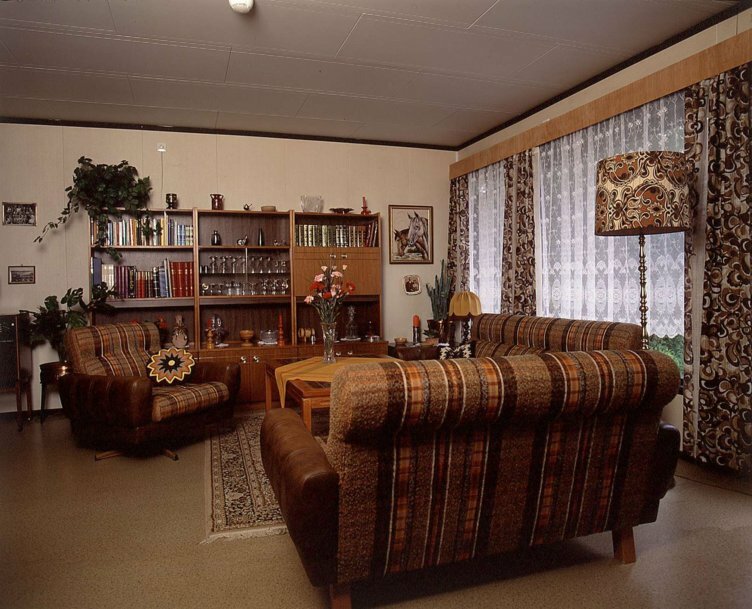 The functionalist-style house is from 1939, but furnished as it might have been in 1944. Photo: Kjell Marius Mathisen/Maihaugen. A smoking table and two armchairs in the living room of the house from the 40s. Photo: Audbjørn Rønning/Maihaugen. The bedroom with the strikingly pink walls. Photo: Audbjørn Rønning/Maihaugen. 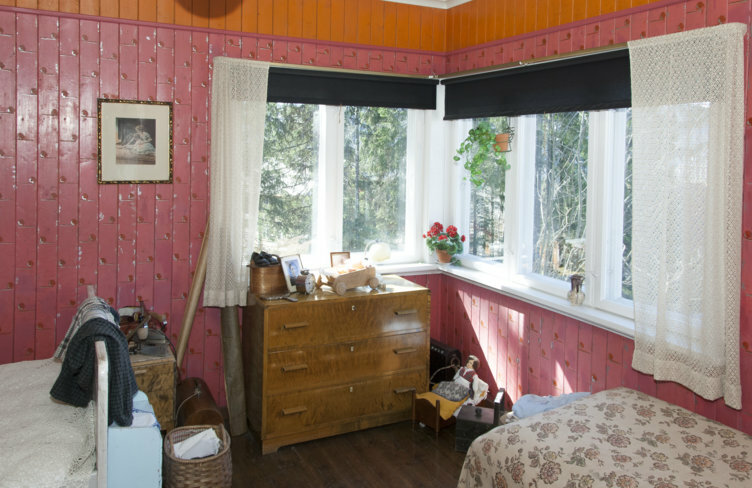 Part of the living room in the house from the 40s at Maihaugen. Photo: Kjell Marius Mathisen/Maihaugen. 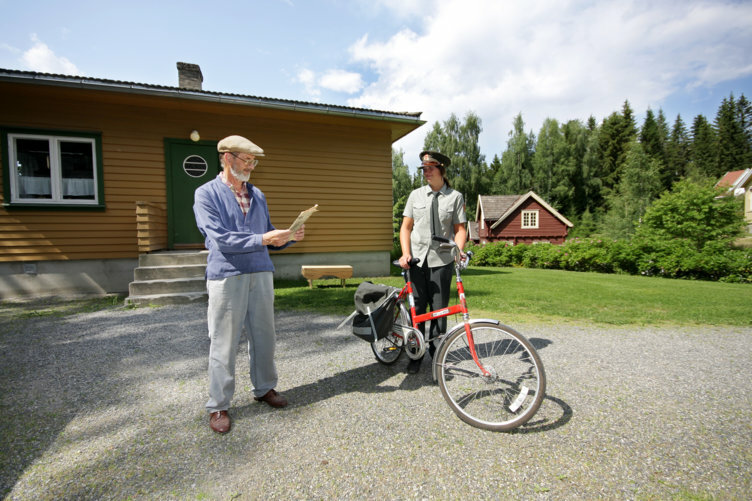 During the summer the wandering theatre performance is taken into the functionalist house. Photo: Jørgen Skaug. The well known red telephone booth is one of the best examples of functionalist design. 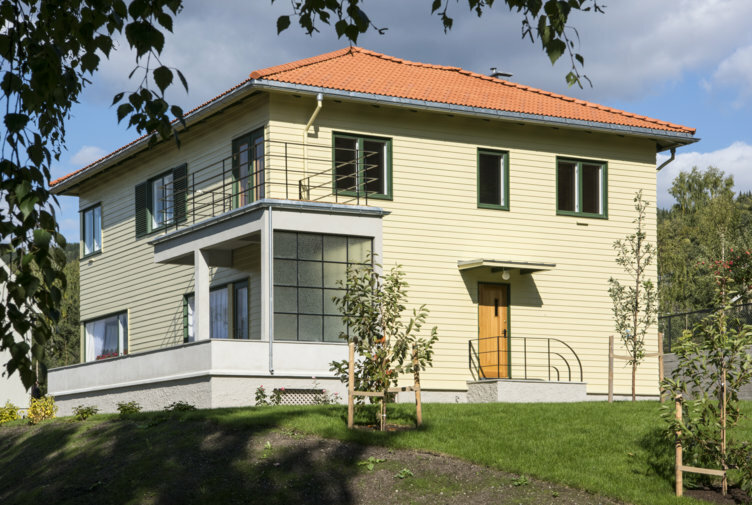 It is the result of an architectural competition arranged by Oslo Telefonanlegg in 1932. The winner was Riks, designed by the architect Georg Fredrik Fasting from Bergen. The telephone booth is one of the foremost examples of functionalist design. At the top of its era there were almost 6,000 placed around the country. 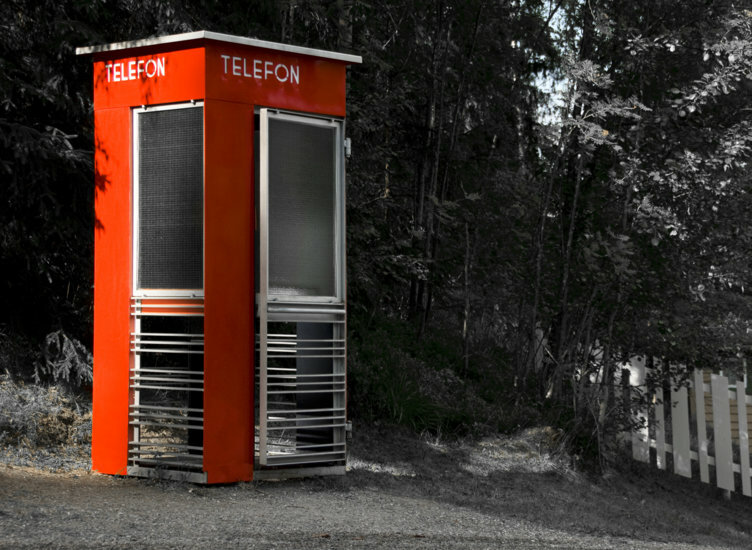 Production was discontinued in 1995 and in 1977 the Directorate for Cultural Heritage declared the Tele-museum and the Telenor telephone booth as worthy of conservation. It was decided to preserve 100 booths. Telephone booth usage declined strongly when the mobile telephone became common during the 1990s. Photo: Camilla Damgård/Maihaugen. 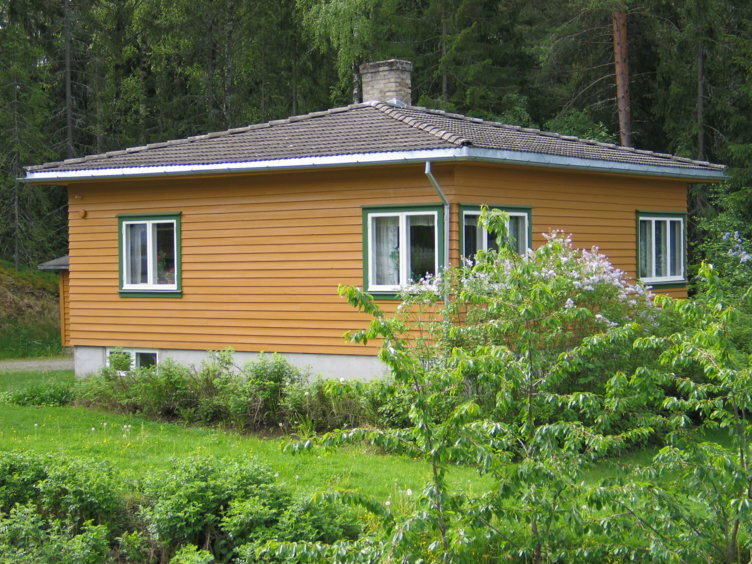 Prefabricated houses became the norm during the 1970s. The largest producer was Moelven. This house is produced in four separate sections that were delivered complete from the factory The foundation wall was ready, so all you had to do was to connect the water and electricity and lay the bricks for the chimney. This was completed in one day. The family who lived here consisted of a mother, father and a son aged 15. The two older children had moved out. The house is called Moelven Senior. The colour is brown, the fashionable colour of the 70s. Indoors too, the 70s colours are strongly evident - brown, green and orange in large, often powerful patterns. Even the white goods have been given colours. At this time people wanted green, brown or yellowy brown fridges and cookers. The latter colour has been chosen here. The TV has entered the living room and is placed centrally. So has the Stressless chair from Ekornes. A colour TV and a Stressless for dad, what more could you want? The house was built in 1974. Gross area of 92 square metres. 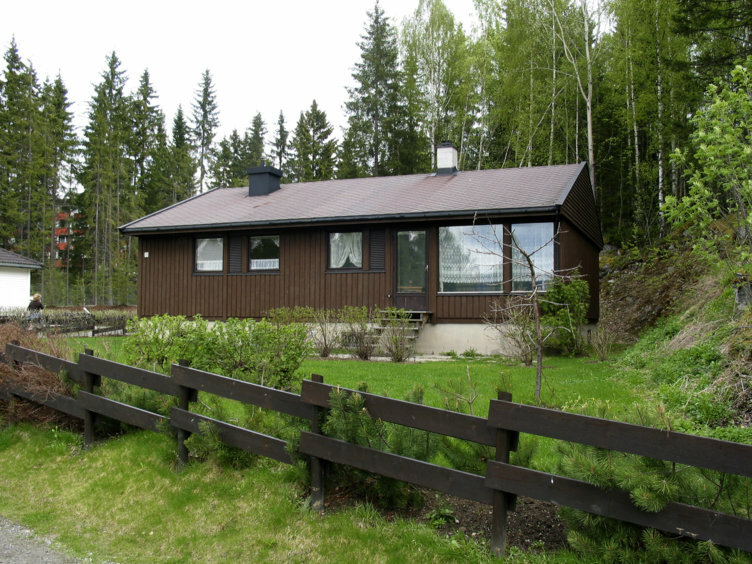 The house was located at Lyngveien 11 at Gardermoen in Ullensaker. 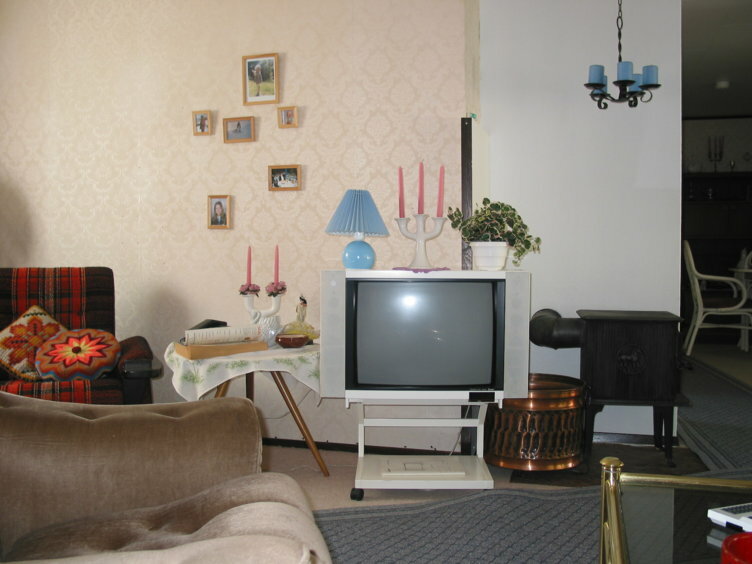 The living room of the house from the 70s is full of furniture and things typical of this period. Photo: Kåre Dehli Thorstad. 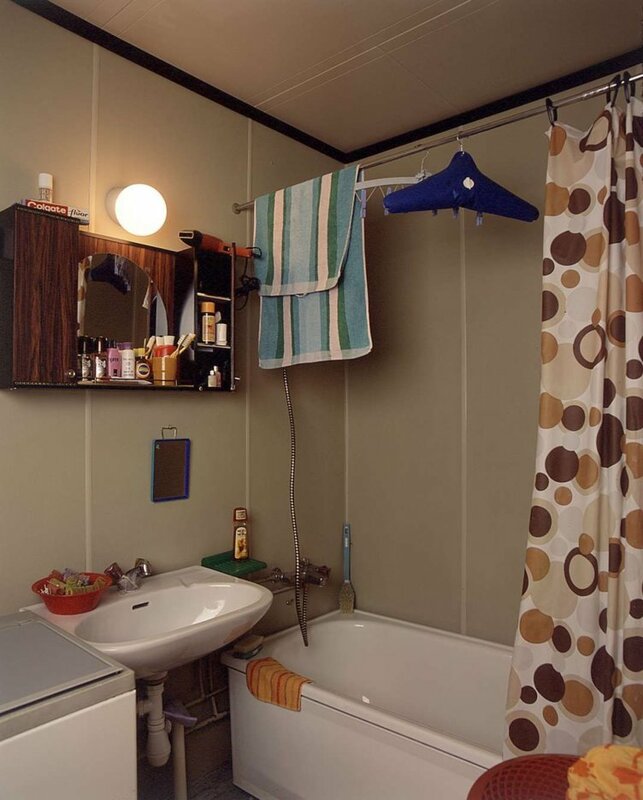 The bathroom in the house from the 70s is typical for its time, and many will feel at home here. Photo: Kåre Dehli Thorstad. The 80s family living directly across the street from the 70s house, has chosen a house produced by Block-Watne (Block 18). The family living here consists of a mother, a father, a teenage daughter and a young son. White houses have become popular. The house consists of one floor with a full basement. It has a hipped roof covered in black cement roofing tiles. The window surrounds have been painted pink. Pastel colours also dominate indoors, pink, light blue and mint green. Patterns are not as eye catching as in previous decades. The housewife’s interest in crochet can be seen from all the small crocheted doilies and other handiworks that have been started and are dotted around the room. The living room has a so-called Korea panel in synthetic mahogany on the end wall, a light coloured velour bowed corner sofa and a large, brass coloured table with a glass top. The terrace is large and partly built over. The outside has become a more important part of the house. You must grill, eat and play and the body must be tanned and trim. Holidays in warmer climes are still out of reach for most people, but you can save miniature bottles anyway when you live close to an airport. The collection of these bottles dominates the living room in addition to other trinkets. The family has also obtained some old objects. It is fashionable to have antiques on display and a samovar and an old milk churn are used for the purpose. One of the many typical 80s articles is the water bed in the parents bedroom. This was very popular for a period, but soon problems arose. Sea-sickness might have been the reason or if there was a big difference in weight, one would lie at the bottom whilst the other had to balance on the top. Leakage and fungus could occur. Water beds are in the main history today. The house was built in 1980. 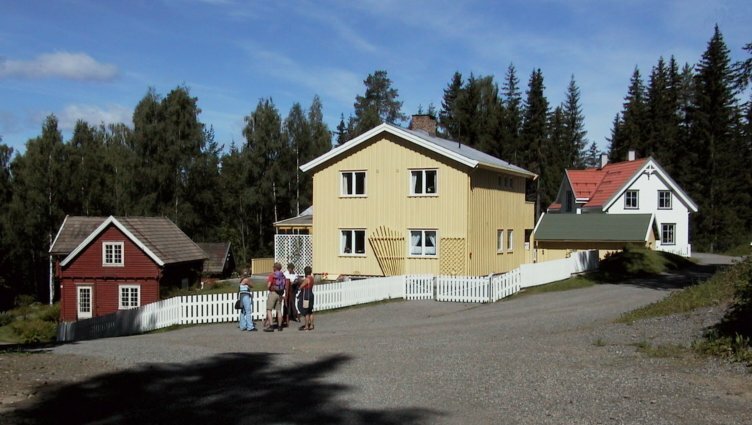 The house was located at Lyngveien 10 at Gardermoen in Ullensaker. It was moved to Maihaugen in 1995 in connection with the expansion of Oslo Airport Gardermoen. Gross area of 95 square metres. The living room naturally contains a white TV. Photo: Maihaugen. The 80s house is open during the summer and you can meet this girl. Photo: Esben Haakenstad. 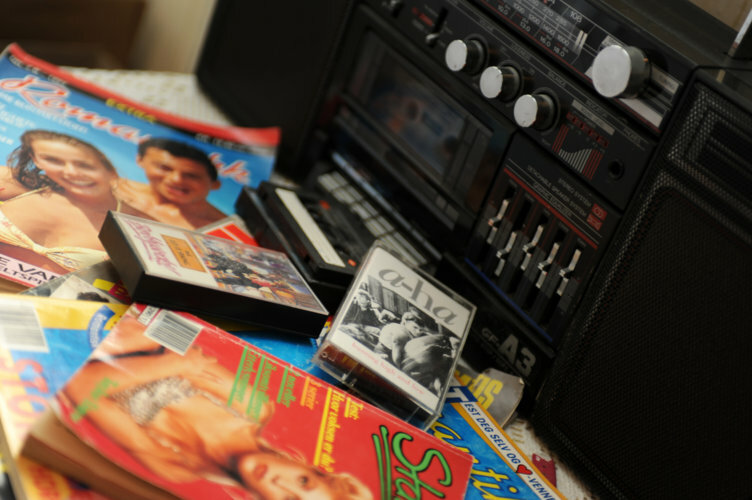 Many teenage rooms during the 80s contained cassette by A-ha and the magazine Romantikk (Romance). Photo: Esben Haakenstad. 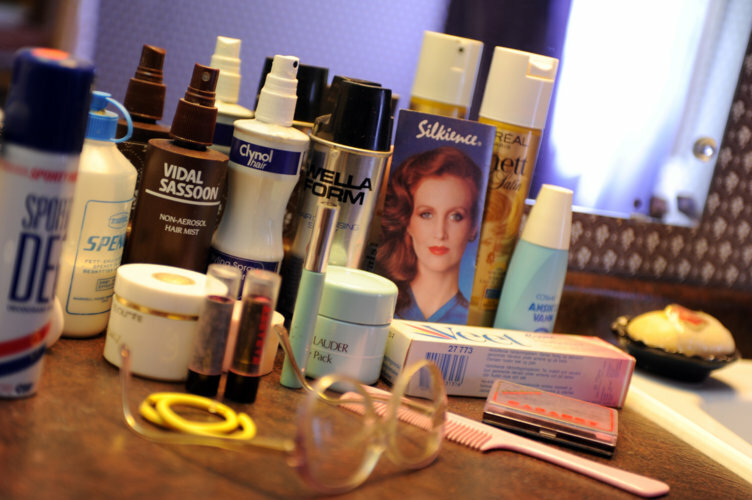 Lots of hairspray was needed to get the hairstyle of the 80s to sit perfectly. Photo: Esben Haakenstad. 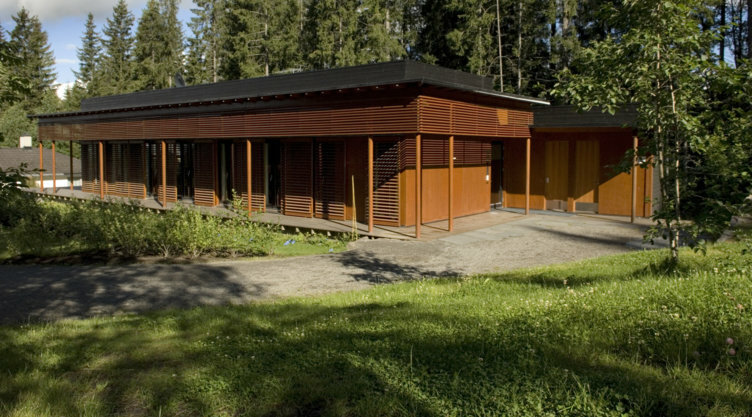 This is a prefabricated house from Hetlandshus called Tradisjon. The name says something about the shape of the house. It has elements of old styles, in this case the Swiss style. It also contains nostalgic elements like a steep roof, cross post windows and decorative details in the gables. This was the most popular prefabricated house type during the 90s. The design was flexible and could be adapted to different terrains. The family living in this house consisted of parents with two children, with the addition of a son from an earlier marriage during weekends. The living area is below the average, but the space is well utilised. The corridor space is used as an office on the ground floor and as a TV room on the first floor. 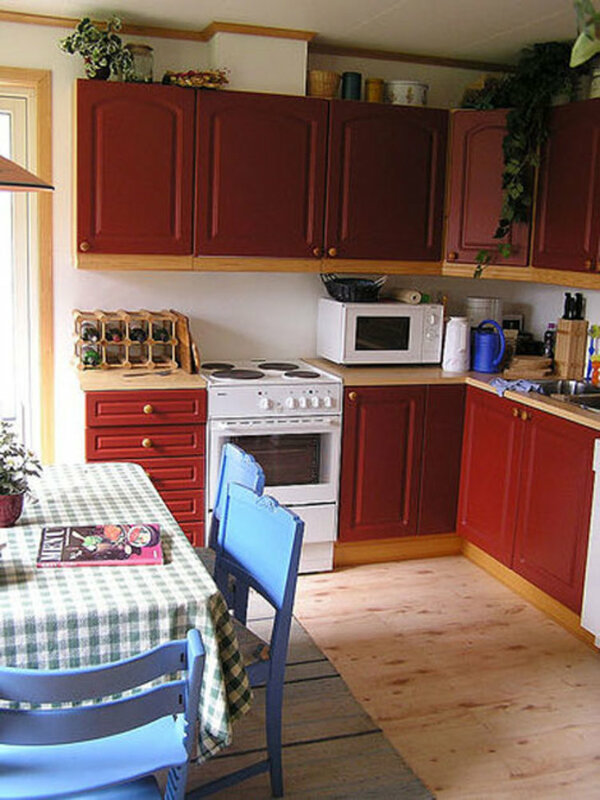 The kitchen is large and contains the only dining area in the house. The room otherwise has features showing an international influence in food preparation. All the technical aids are present. The new microwave has started to become common property. The living room is decidedly small and strong colours dominate - this is the end of the pastels of the 1980s. The walls are strikingly yellow and the curtains are colourful. One of the two TVs in the house is placed here. The media world is making an impact with stereos, video players and cassette recorders. In the office there is a Macintosh - the digital world is surrounding us This is an old model that has previously been used at work. It was only in use for writing. A large and comfortable bathroom was a high priority. The bathroom is the same size as the bedrooms. You need to take a shower at least once a day. Well-being has a high priority. The house was built in 1995. It was erected at Maihaugen as a copy of a house in Lillehammer. Gross area of 129 square metres. Strong colours and flowers over the cupboards. Photo: Maihaugen. The house from the 1990s also had a garage. Photo: Maihaugen. This type of house was the most popular during the 90s. Photo: Maihaugen. The period of pastels, which dominated some years ago, has come to an end. 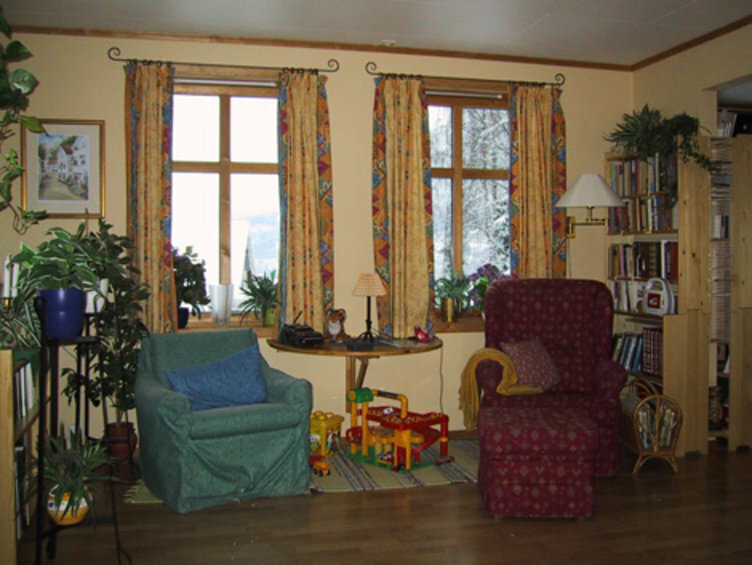 Colourful curtains and strikingly coloured walls are the order of the day. Photo: Maihaugen. In 2001, Telenor built a house at Fornebu. This was meant to be futuristic, and was to be used as a laboratory for entertainment technology, communication technology and similar for the home. Every room is on the same floor. There is a corridor running the length of the house. The technical functions such as bathrooms utility room, kitchen unit and a separate room for multimedia equipment and computers are installed in the northern side of the building. The living quarters are in the southern part of the building. In this area the ceiling is high and there are large windows that let in lots of daylight. The internal walls are not load-bearing. It is therefore easy to change the room divisions as requirements change. The house of the future’s modern design contrasts with the nostalgic detached houses that were presented in the prefabricated house catalogues during the 1990s. 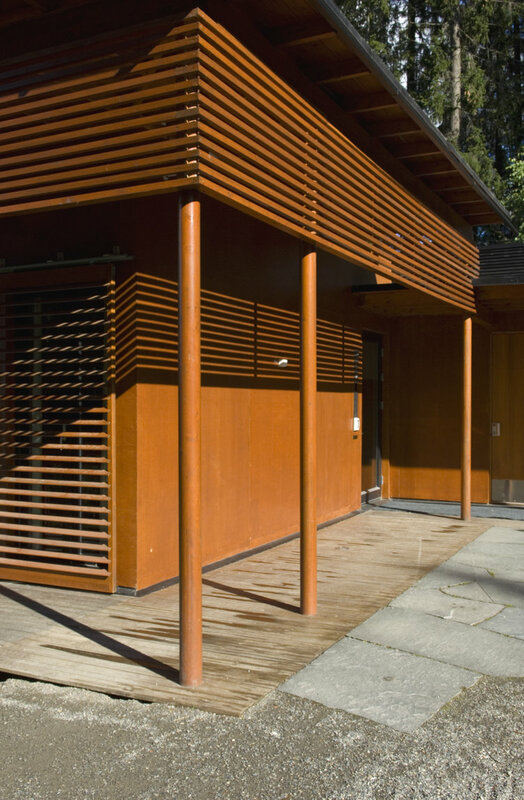 The horizontal lines, the simple shape and the use of oiled wood are characteristic of the houses designed by Norwegian architects around the turn of the millennium. The house is designed by Div. A. Architects A/S in Oslo. The house of the future was a collaboration between Telenor and the Housing Bank. The house was a laboratory for the development of technology for the home. It was possible to gather researchers with different experience under one roof and find concrete solutions to everyday issues. The aim of the research was to simplify everyday life in order for people to use more time on the things they wanted to prioritise. The house of the future is built in a modern style. Photo: Camilla Damgård/Maihaugen. The exterior and interior are both in a minimalistic style. Photo: Camilla Damgård/Maihaugen.